Grab a bite of lip-smacking pizzas with your all time favorite pizza hub Dominos. 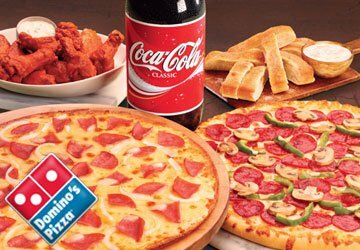 Here is a foodie deal from Nearbuy where you can avail a Dominos Pizza Gift voucher worth Rs.500 at just Rs.249. So celebrate your feast with your family, friends, collegues with variety of pizzas available in exciting flavours. You can also enjoy pasta, puddings, drinks & beverages apart from pizza on your favorite food hub Dominos!! Use Payumoney wallet to avail an extra 1% off. Offer valid till 31st May 2016. Voucher is applicable for single user. Valid only online through web/app orders. Other discounts cannot be clubbed in order to redeem this voucher. Valid at all Dominos restraunts except Airport restaurants. This voucher is non refundable. In case the bill exceeds voucher amount worth Rs.500, user will have to pay an extra cost by cash only for COD basis. So what you are waiting for ? Get your Dominos Gift Voucher now and enjoy 50% off on delicious Dominos pizzas available only at Nearbuy! !